González, Yanilda 2019. The Social Origins of Institutional Weakness and Change: Preferences, Power, and Police Reform in Latin America. World Politics, Vol. 71, Issue. 1, p. 44. Kumar, Ashwani and Banerjee, Souradeep 2019. Human Rights Literacies. Vol. 2, Issue. , p. 235. Hoque, Ashraf and Michelutti, Lucia 2018. Brushing with Organized Crime and Democracy: The Art of Making Do in South Asia. The Journal of Asian Studies, Vol. 77, Issue. 4, p. 991. Thaut Vinson, Laura 2018. Disaggregating Ethnicity and Conflict Patterns: Evidence From Religious and Tribal Violence in Nigeria. Ethnopolitics, p. 1. Malik, Aditi 2018. Constitutional reform and new patterns of electoral violence: evidence from Kenya’s 2013 elections. Commonwealth & Comparative Politics, Vol. 56, Issue. 3, p. 340. Müller-Crepon, Carl and Hunziker, Philipp 2018. New spatial data on ethnicity. Journal of Peace Research, Vol. 55, Issue. 5, p. 687. Soper, J. Christopher and Fetzer, Joel S. 2018. Religion and Nationalism in Global Perspective. Arnold, Richard and Markowitz, Lawrence P. 2018. The evolution of violence within far-right mobilization: evidence from Russia. Ethnic and Racial Studies, Vol. 41, Issue. 9, p. 1558. Bhavnani, Rikhil R. and Lacina, Bethany 2018. Nativism and Economic Integration Across the Developing World. Hansen, Holley E Nemeth, Stephen C and Mauslein, Jacob A 2018. Ethnic political exclusion and terrorism: Analyzing the local conditions for violence. Conflict Management and Peace Science, p. 073889421878216. Akwei, Cynthia 2018. Mitigating Election Violence and Intimidation: A Political Stakeholder Engagement Approach. Politics & Policy, Vol. 46, Issue. 3, p. 472. Birch, Sarah and Muchlinski, David 2018. Electoral violence prevention: what works?. Democratization, Vol. 25, Issue. 3, p. 385. Finley, Theresa and Koyama, Mark 2018. Plague, Politics, and Pogroms: The Black Death, the Rule of Law, and the Persecution of Jews in the Holy Roman Empire. The Journal of Law and Economics, Vol. 61, Issue. 2, p. 253. Elfversson, Emma and Höglund, Kristine 2018. Home of last resort: Urban land conflict and the Nubians in Kibera, Kenya. Urban Studies, Vol. 55, Issue. 8, p. 1749. Nakai, Ryo 2018. Does Electoral Proximity Enhance National Pride? Evidence from Monthly Surveys in a Multi‐ethnic Society – Latvia. Studies in Ethnicity and Nationalism, Vol. 18, Issue. 3, p. 198. Michelitch, Kristin and Utych, Stephen 2018. Electoral Cycle Fluctuations in Partisanship: Global Evidence from Eighty-Six Countries. The Journal of Politics, Vol. 80, Issue. 2, p. 412. Why do ethnic riots break out when and where they do? Why do some governments try to prevent ethnic riots while others do nothing or even participate in the violence? 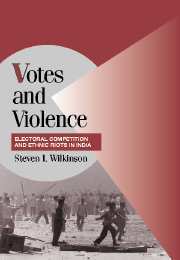 In this book, Steven I. Wilkinson uses collected data on Hindu-Muslim riots, socio-economic factors and competitive politics in India to test his theory that riots are fomented in order to win elections and that governments decide whether to stop them or not based on the likely electoral cost of doing so. He finds that electoral factors account for most of the state-level variation in Hindu-Muslim riots: explaining for example why riots took place in Gujarat in 2002 but not in many other states where militants tried to foment violence. The general electoral theory he develops for India is extended to Ireland, Malaysia and Romania as Wilkinson shows that similar political factors motivate ethnic violence in many different countries. Government of Uttar Pradesh. 1962. Report of the Uttar Pradesh Police Commission, 1960–61. Allahabad: Superintendent of Printing and Stationery, U.P. Gupta, Raghuraj. 1976. Hindu-Muslim Relations. Lucknow: Ethnographic and Folk Culture Society, U.P.